One of my goals for this year is to clear off projects that I have started and not finish. 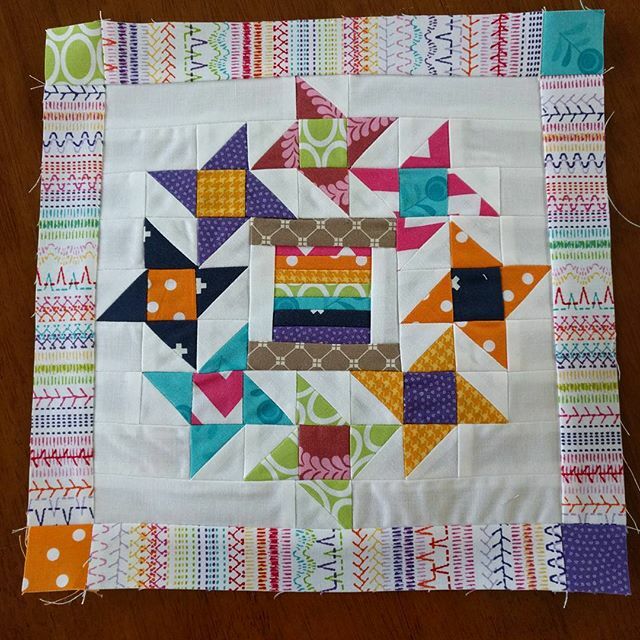 Well this little mini quilt just happens to be one of them! While cleaning up my sewing space, I found this and a few other mini quilts I has cut out for myself and decided now was the perfect time to just get them done! Instead of just a plain block in the center, I decided to add a mini spool. This will be perfect for my new sewing room. Now to just decide on quilting! Love it! It's so bright and happy! I'm going to try my best, thanks! I love these colours, and its a great block! Thanks, I love this little block! so colourful, I like it ! Thank you, trying to clean my space before I move to a dedication sewing room! Bright and fun. I love that border fabric. Thank you, the border fabric is one of my favorites from my LQS.